Dexcom is here to provide you with ongoing support and answer any questions you may have about your Dexcom CGM System. Locate the right support department below based on your immediate needs. Dexcom G6® CGM System will be covered for Medicare beneficiaries, having met the category requirements for therapeutic CGM systems by the U.S. Centers for Medicare & Medicaid Services (CMS). Coverage for therapeutic CGM includes certain beneficiaries who have either Type 1 or Type 2 diabetes and intensively manage their insulin. We encourage customers to get started with Dexcom G5 now as they’ll be automatically upgraded when G6 becomes available and they’re out of warranty on their Dexcom G5 transmitter. What features are included in the latest update to the Dexcom G5 Mobile App? If you rely on your Apple or Android device to view your Dexcom Continuous Glucose Monitoring (CGM) System glucose readings, you will see new features when you update your Dexcom G5 Mobile App to version 1.7.5. These updates are a result of requests from our valued customers, like you. We hope they help. We know that your life runs on more than one schedule – and now your Dexcom G5 Mobile can, too! 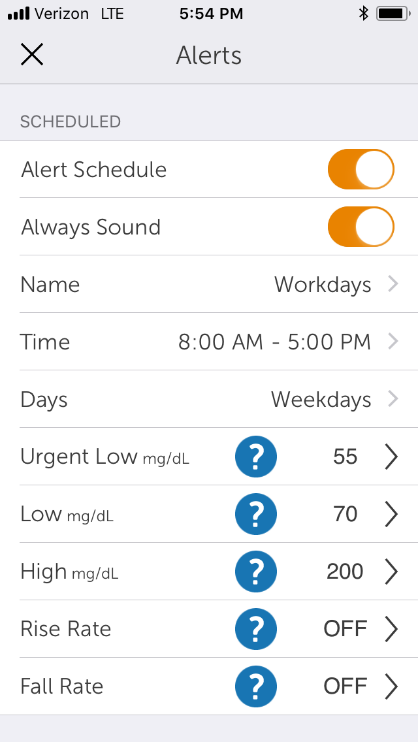 The new Dexcom G5 Mobile App feature, Alert Schedule lets you schedule and customize a second group of alerts that only apply during the hours you specify. For example, set the schedule to match your work hours, active Monday-Friday 8am-5pm. The first time you turn on Alert Schedule in the app’s Alert Menu, you will be guided through setting up your schedule and choosing days and times for which the schedule applies. We’ve also added a setting to Alerts called Always Sound, which replaces Mute Override and is on by default. Use Always Sound to ensure Alerts sound when your device is silenced or on Do Not Disturb. For example, you want to silence your phone during school, but still hear your Low Alert. To do this, turn on Do Not Disturb in your phone settings, turn on Always Sound in the Dexcom App, and choose a sound other than Vibrate Only for your Low Alert. On Android, all Alarm/Alerts are silenced when using the most restrictive Do Not Disturb setting. On Apple, your Signal Loss can’t sound in Silent or Do Not Disturb. 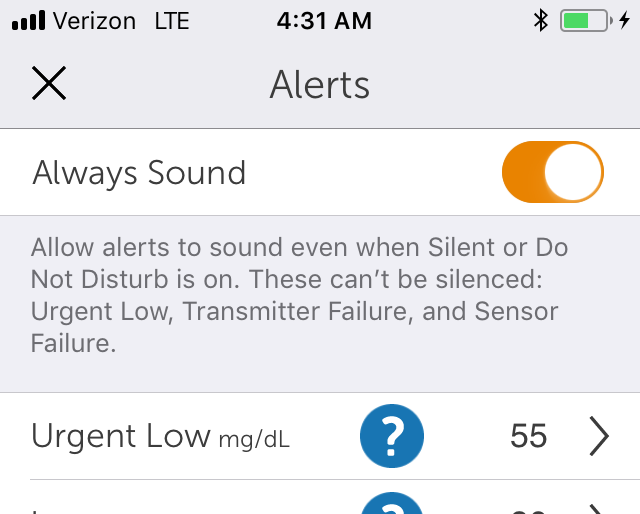 You can find more information on both Alert Schedule and Always Sound in your Dexcom G5 Mobile User Guide. If you have questions about CLARITY, please contact the Dexcom Care Team at PatientCare@dexcom.com or call 1 (888) 738-3646, ext 4900. How do I insert my sensor? How Can I Reinforce my Sensor Adhesion? Having problem with the sensor pod not sticking? Before inserting the sensor make sure your skin around the insertion site is free of creams, lotions, or perfume. After cleaning the area with alcohol wipes, let it dry completely. Still having problems? Put medical tape (such as Blenderm, Tegaderm, IV 300 or 3M tape) over the sensor pod’s adhesive patch, making sure you don’t tape over the transmitter. Q: Is Dexcom covered by Medicare? Dexcom is now shipping the Dexcom G5® Continuous Glucose Monitoring (CGM) System to Medicare patients with traditional fee-for-service coverage. Please note that at this time, we are not able to process Medicare Advantage plans. We are continuously working to make this happen and will provide updates as more information becomes available. We certainly appreciate your ongoing patience as we continue working through our queue of Medicare orders in the order they were received. We have contracted with Ascensia to provide the Contour® Next One blood glucose meter in the bundle of products covered by Medicare. Today, we are not licensed to service all 50 states, so we will also be using Medicare distributors to support us. I’m a Medicare patient. How do I know if I’m covered? The beneficiary's insulin treatment regimen requires frequent adjustments by the beneficiary on the basis of therapeutic CGM testing results. Every six (6) months following the initial prescription of the CGM, the beneficiary has an in-person visit with the treating practitioner to assess adherence to their CGM regimen and diabetes treatment plan. Is Dexcom G6 covered by Medicare? When will the G6 System be available to Medicare customers? Dexcom will start shipping G6 to all Medicare customers in Q4 2019. I am a current Medicare customer using Dexcom G5 Mobile - how do I upgrade to G6? When we begin shipping Dexcom G6 in Q4 2019, existing customers will be automatically upgraded to G6 when they are out of warranty on their Dexcom G5 transmitter. Customers do not need to do anything currently. Dexcom will be checking their eligibility at the monthly check in. How can I view my glucose data? According to the CMS policy, Medicare patients are permitted to use a smart device in conjunction with the Dexcom G5 Receiver to view glucose data. Coverage of CGM system supplies and accessories are available for those therapeutic CGM systems where the beneficiary uses a receiver classified as DME to display glucose data. There is no Medicare benefit for supplies used with equipment that is not classified as DME. However, Medicare coverage is available for the CGM system supplies and accessories if a non-DME device (smartphone, tablet, etc.) is used in conjunction with the durable CGM receiver. Coverage of CGM system supplies and accessories are available for those therapeutic CGM systems where the beneficiary uses a receiver classified as DME to display glucose data. If a beneficiary intends to never use a receiver classified as DME as the display device, the supplies and accessories are not covered by Medicare. Beneficiaries should reach out to 1-800-MEDICARE with any questions about the Medicare requirements for Dexcom CGM. I have a compatible smart device. How do I use my smart device to see my Dexcom G5 readings? 1. Go to the App Store or Google Play store from your smart device. Search for “Dexcom G5 Mobile”. Download and open the app. 2. Create account or log in using your Dexcom account. For example, a Dexcom Clarity account. 3. Follow the instructions in the app. When asked, enter the serial number (SN) of the transmitter you’re wearing. This can be found on the transmitter box, back of the transmitter or in your Receiver Settings. 4. Your app joins your current sensor session. How do I set up Dexcom Share? Dexcom Share is a feature of the Dexcom G5 Mobile app. To set up Dexcom Share, press the Share icon (triangle in upper right hand of screen) and follow the instructions. The app will walk you through sending invitations to up to 5 Followers. Your Followers will need to download the Dexcom Follow app. The ruling specifically states that only CGM products labeled as a replacement of fingerstick blood glucose testing for diabetes treatment decisions by the FDA and referred to in the ruling as “therapeutic CGM” will be covered. How do I get my Dexcom G5 CGM System? New patients should contact Dexcom by visiting www.dexcom.com/medicare-coverage and submitting a Dexcom G5 CGM interest form. Priority will be given to existing Dexcom CGM patients followed by new patients in the order they were originally received. As our sales representatives work through the queue, patients can expect to hear from Dexcom or an authorized Dexcom distributor about getting started. This will be a slow process and we appreciate everyone's ongoing patience during this process. Who will send me my Dexcom G5 CGM System? Dexcom is now shipping G5 CGM supplies directly to eligible Medicare fee-for-service coverage. We have contracted with Ascensia to provide the Contour® Next One blood glucose meter in the bundle of products covered by Medicare. Today, we are not licensed to service all 50 states, so we will also be using Medicare distributors to support us. How much can I expect to pay for my Dexcom G5 CGM System? Patients who are covered by Medicare can expect to cover 20% of the costs, although this additional amount may be covered by secondary insurance. Medicare will cover the remaining 80%. I am using a Dexcom G4 PLATINUM CGM. How will this affect me? The ruling specifically states that only CGM products approved by the FDA as a replacement of fingerstick blood glucose testing for diabetes treatment decisions (therapeutic) would be covered, so the Dexcom G4 PLATINUM will not apply. Currently, only the Dexcom G5 CGM System meets this criteria and would be eligible for Medicare coverage. Patients using Dexcom G4 PLATINUM may want to talk to their physicians or Dexcom to see if they would be eligible for Dexcom G5 CGM System. How do I know if my smart device is compatible with the Dexcom G5 CGM System? For a list of compatible devices, visit www.dexcom.com/compatibility.